This Mexican Crispy Potato Bowls recipe shows you how to make crispy potatoes! The potatoes are scented with cumin and oregano, served with broccoli and fried garlic, ground pasture-raised meat, topped with a fried or poached egg and a sprinkle of red pepper flakes or pink peppercorns and served with a beautiful, cashew-based, dairy-free, cilantro-avocado cream sauce: Mexican breakfast for dinner, with the addition of nutritious greens and a comforting, creamy sauce to dress it up. This comfort food is especially for Whole30 and Paleo. I dreamed this dinner up a couple years ago after learning the trick for making roasted or fried potatoes extra crispy on their outsides. 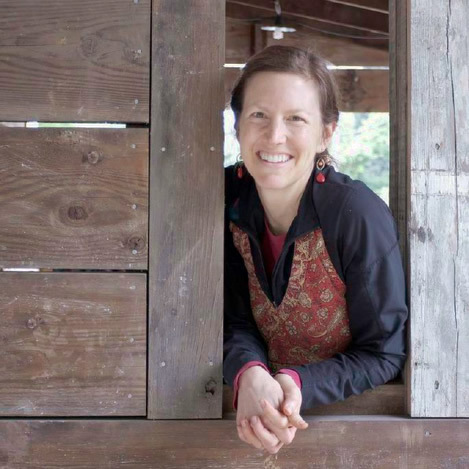 Whole30 had emerged on the scene of wellness diets and decided that potatoes were in fact a food to include during the 30 days of elimination. Most of the world exploded with glee at this announcement because: Potatoes! Who doesn’t love their starchy satisfying middle and their, if we’re lucky, crispy French-fry exterior? But most home fries leave us wanting for perfection. That’s where the secret ingredient comes in: baking soda. Adding just half a teaspoon of baking soda to the boiling water we use to cook the potatoes creates a starchier potato. With the potato chunks coated in their own starch, the sides and edges get … crispy when baked just right! In this Mexican Crispy Potato Bowl, the potatoes are roasted with cumin and oregano to further enhance their broad and deep appeal. Just saying this recipe is Whole30 indicates that it’s healthy. To magnify a couple of those particulars, I’ll zero in on the lovely-large amount of cilantro in the Avocado-Crema sauce! Wonderful flavor and nutrition. Also the avocados and garlic fried broccoli. 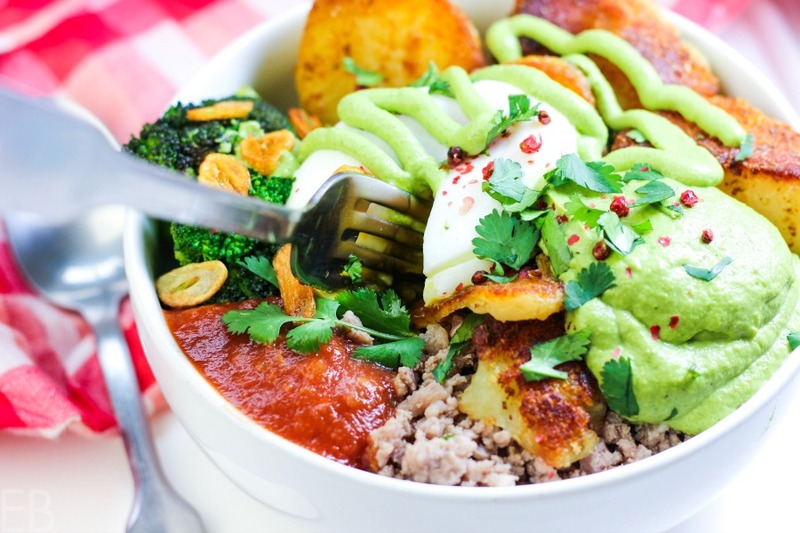 To paint the whole picture, the beautifully crispy potatoes are topped with all the Mexican dairy-free comfort foods of our dreams: a cashew-based cilantro-avocado cream sauce, poached eggs, spiced meat, broccoli cooked in traditional fat with fried garlic … plus salsa. Dive in with your fork and never look back. 🙂 Top with a sprinkle of red pepper flakes if you like it spicy or pretty crushed pink peppercorns for less spicy. 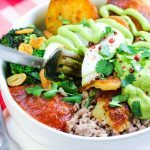 You can make this Mexican Crispy Potato Bowl dinner … for breakfast of course, too, if you want to prepare a special buffet breakfast that’s Whole30 and Paleo. 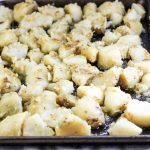 You can also “steal” the Crispy Potatoes from this larger recipe and make yourself Crispy Potatoes for breakfast (or dinner) alongside eggs and bacon and sausage or whatever. These potatoes make a great side dish or an exciting bowl. You can poach or fry the eggs that go on top, whichever you prefer. Fried eggs are nice because they’re casual, fast and impromptu. Poached eggs are more elegant and impressive (if that’s important for your meal), and perhaps more importantly: They can 1) be prepared ahead of time if you enjoy batch cooking, and simply heated in a moment by placing them in very hot water or 2) be kept hot in warm water until you’re ready to serve, which isn’t possible with fried eggs. Lastly, the texture plays in. Sometimes I poach my eggs just because I love that silky smooth texture. But I like and choose both options, depending on the situation. Of course, fried eggs are a bit easier. But follow these directions for keeping it simple if you choose to poach your eggs. Place potatoes in large stock pot. Cover by 2 inches with water. Add baking soda. Turn burner on high. Bring to a boil, and cook until almost fork tender, about 10-15 minutes, after the water begins to boil. Pour potatoes into colander. While potatoes cook, make the Avocado Crema recipe below. Preheat the oven to 425 degrees Fahrenheit. Once drained, place warm/hot potatoes into a large bowl with remaining Crispy Potato ingredients: preferred fat, oregano, cumin and sea salt. Stir. Pour potatoes onto a greased cookie sheet, and spread them into one layer. Place all Avocado Crema ingredients in the blender. Purée on medium speed until smooth, about 30 seconds. (Stop motor, scrape down sides, and add a bit more water if needed to blend easily and get the right consistency.) Set aside until ready to serve. About 10-15 minutes before the potatoes are done cooking, begin: Heat large skillet over high heat. Add 2 tablespoons fat of choice. Add broccoli and sea salt. Sauté over medium heat 8-10 minutes until broccoli is cooked to your liking. Heat large skillet over high heat. Add beef and sea salt. Lower heat to medium-high. Cook meat, breaking it up with spatula, 8-10 minutes, until cooked through to your liking. To poach eggs: Crack each egg separately into a (small) bowl or saucer. Bring a pan of water filled at least 2 inches deep to a simmer. Add a drop of vinegar. Reduce the heat below the pan, and slide in one egg at a time: Slowly tip the first egg into the center of the pan. Maintain the right heat under your pan so there are small bubbles rising. Once the egg begins to set, gently push it to one side of the pan. Add your next eggs in the same manner as the first. As each one cooks (about 3-4 minutes), lift the egg out with a slotted spoon and drain it on dish towel. If you wish, trim off any straggly bits from the edges, and keep it at the right temperature in warm water. See link in Recipe Notes for video and more detailed instructions on poaching eggs if helpful. To fry eggs: Heat pan over medium-high heat. Add 1 tablespoon avocado oil to pan. Crack each egg into the pan. Optionally, add 1/4 cup water to pan. Season lightly with sea salt. Cover the pan with a lid, and cook for 3 minutes over low heat. Check the white is set and, if not, cook for another 30 seconds; then check again. Have your eaters serve themselves or dish it up for them. Each bowl: baked Crispy Potatoes on the bottom or to one side, ground meat to one side or on top. Add broccoli. Top with fried or poached eggs. Top with salsa and Avocado Crema. Garnish with fresh cilantro if desired. Serve! See more detailed instructions and a video on how to poach an egg here. Place cashews in medium size bowl. Cover with room temperature water by two inches. Add 1/4 teaspoon sea salt to help with digestion, if desired. Soak at least two hours or up to 6 hours. Pour into colander. Rinse with fresh water. Your cashews are now ready to use. Loved this bowl because I love “buffet style” eating with a good variety on my plate! That poached egg almost stole the show! Perfect crispy goodness…worked like a charm! And that crema was over the top! Yay, terrific. Thanks for sharing your experience Tessa! 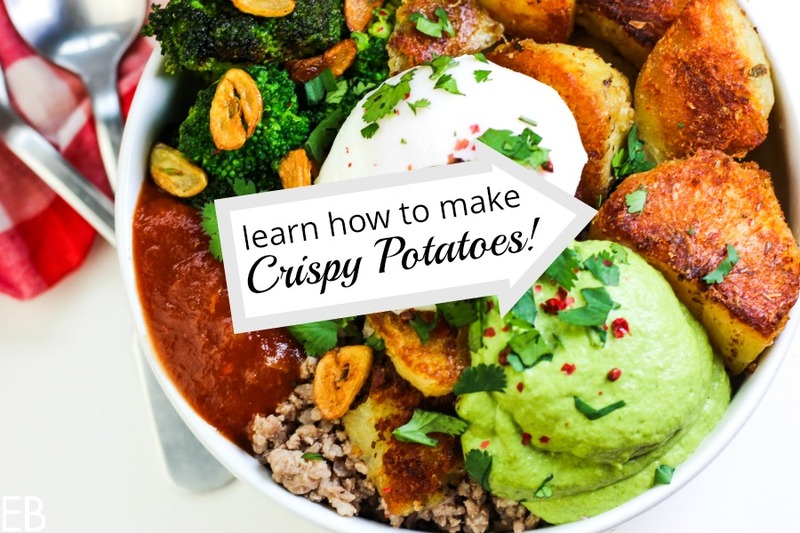 That is a really cool method for the crispy potatoes – we are big fans of crispy potatoes for breakfast so I’m going to try this method! That avo crema though too! I love that perfect drippy egg on top – def my kinda breakfast! I need more crispy potatoes in my life, this sounds delicious!! I LOVE Mexican flavors, and this sounds amazing! That crispiness is to die for. 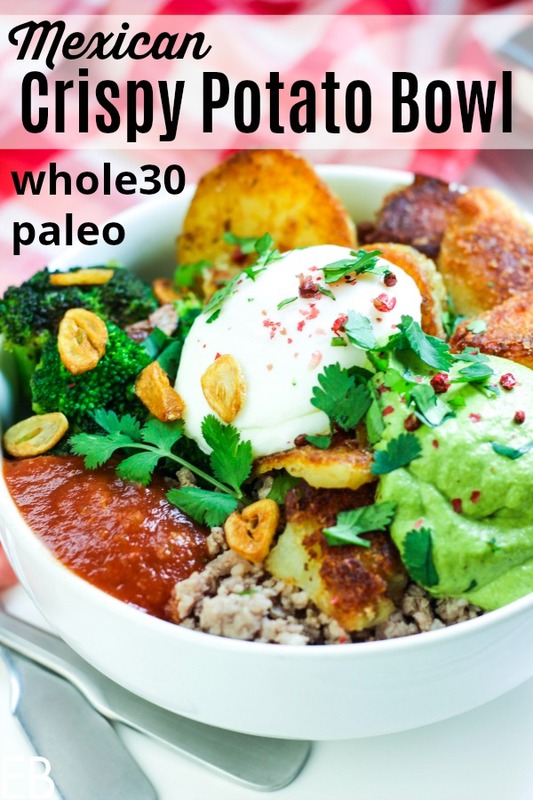 Perfect for whole30 followers, or pretty much anyone! This is EXACTLY the way I like to compose a meal: protein, starchy veg, low-carb veg and anything to add more flavor like a sauce. Can’t wait to add this to my weekly cookup! I loved all the different elements to this dish, that avocado crema was sooo tasty! And you can never go wrong with crispy potatoes! This bowl has my name on it, for pretty much any meal of the day. I want in! LOL, thanks Kelly! I agree that this would make the yummiest late breakfast! This bowl looks absolutely amazing, and I can’t wait to try your crispy potato method! This is to die for! I love Mexican comfort food. I loved your crispy potato method. These look amazing. This is a refreshing take on a breakfast/dinner bowl. Mexican cuisine lends itself so well to buffet style serving. If you had a rating system, I’d give this 5 stars! This is such a delicious looking dinner! I love all of the ingredients that you have in here! Confession (besides herbs etc) Potatoes are my favourite!! I will make this potato bowl recipe asap. It’s got all my most scrumptious flavours. I would make it right now except .. horror.. I have NO taters in the house.. Thanks as always for an amazing idea (or 10) and gorgeous pics with easy to follow instructions!